HERE’S A SHORTLIST OF 10 BEGINNER SAILING TERMS THAT EVERYONE SHOULD KNOW. IF YOU’RE JUST LEARNING HOW TO SAIL, THESE HANDY TERMS CAN PROVIDE A HELPFUL OVERVIEW OF SAILING BASICS YOU NEED TO BECOME FAMILIAR WITH. 1. Aft – The back of a ship. If something is located aft, it is at the back of the sailboat. The aft is also known as the stern. 2. Bow – The front of the ship is called the bow. 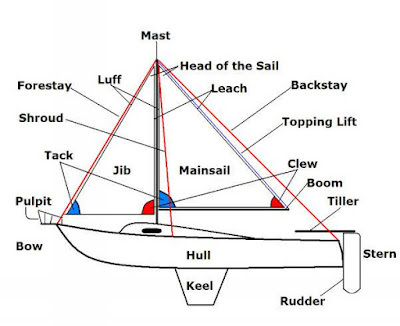 Knowing the location of the bow is important for defining two of the other most common sailing terms: port (left of the bow) and starboard (right of the bow). 3. Port – Port is always the left-hand side of the boat when you are facing the bow. Because “right” and “left” can become confusing sailing terms when used out in the open waters, port is used to define the left-hand side of the boat as it relates to the bow, or front. 4. Starboard – Starboard is always the right-hand side of the boat when you are facing the bow. 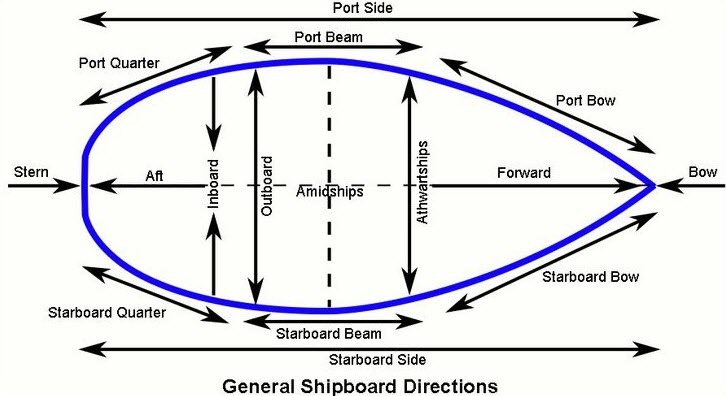 Because “right” and “left” can become confusing sailing terms when used out in the open waters, starboard is used to define the right-hand side of the boat as it relates to the bow, or front. 5. Leeward – Also known as lee, leeward is the direction opposite to the way the wind is currently blowing (windward). 6. Windward – The direction in which the wind is currently blowing. Windward is the opposite of leeward (the opposite direction of the wind). Sailboats tend to move with the wind, making the windward direction an important sailing term to know. 7. Boom – The boom is the horizontal pole which extends from the bottom of the mast. Adjusting the boom towards the direction of the wind is how the sailboat is able to harness wind power in order to move forward or backwards. 8. Rudder – Located beneath the boat, the rudder is a flat piece of wood, fiberglass, or metal that is used to steer the ship. Larger sailboats control the rudder via a wheel, while smaller sailboats will have a steering mechanism directly aft. 9. Tacking – The opposite of jibing, this basic sailing maneuver refers to turning the bow of the boat through the wind so that the wind changes from one side of the boat to the other side. The boom of a boat will always shift from one side to the other when performing a tack or a jibe.